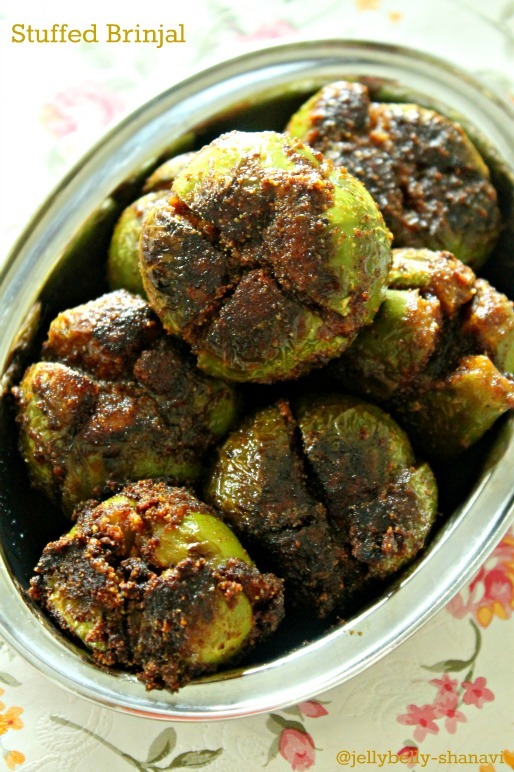 Stuffed brinjal are one of my fav recipes from my side of my family.. Whenever my mom makes this, she would cook with 2 kg of brinjal cos I'll go on n on for the rest of the week. And now this is in my menu sadly for twice or thrice a month all cos of my partner who is not a big fan of this veggie.But when I make them I'll give no choice for anyone but having them. So, what are we waiting for ? Here it is people..
Heat the oil and fry the masala given one by one slowly over a medium low flame in the following order , red chillies,hing, coriander seeds ,channa dal, peanuts, sesame seeds,curry leaves ,coconut. 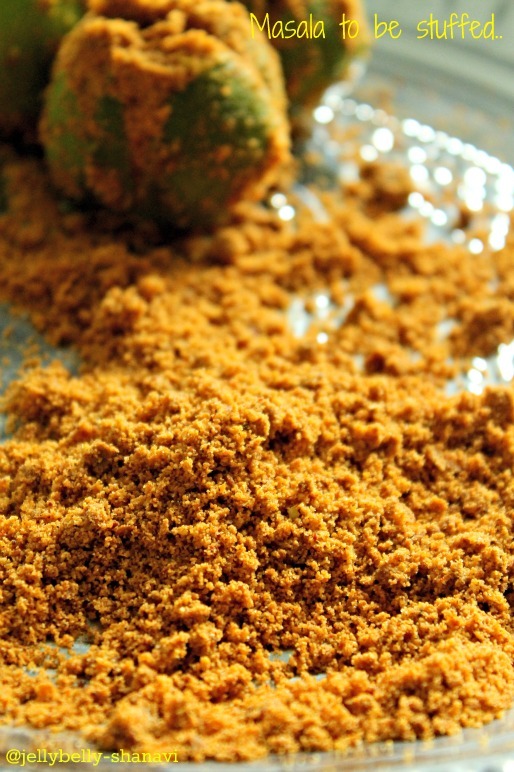 The entire roasted masala should be golden brown in colour including the coconut. 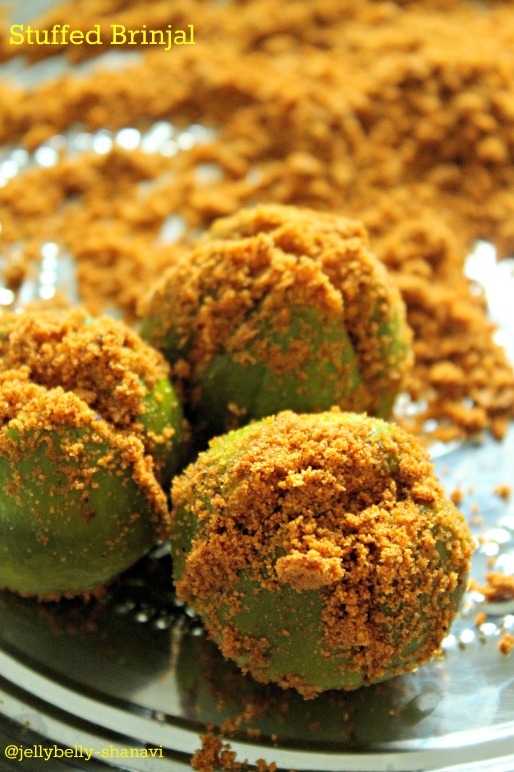 Cool off a bit and powder finely/semi coarsely (ur preference) with salt using the mixer/blender. In the mean time,clean the brinjal and remove the stem,I mean, the top portion. And cut the brinjals like in the picture. Do not cut all the way down. Just enough to make a slit an inch length. Add water to the pot, mere to cover all the brinjal and throw in the red chilli powder,turmeric powder and salt. Mix well and cook over medium flame until the brinjal are half cooked. Fish out the brinjals, spread on a plate and throw away the water. Let cool the brinjal for few minutes. Remove from the pan and place on a serving plate. Tastes good when served hot/warm. Always select small brinjal, probably a fresher one. Small one's taste great. My mom cooks this way rather than directly placing the raw brinjal in the hot oil and so did I. If u want the other way, U r welcome to do it. delicious tempting and yummy stuffed brinjals. wonderful recipe. looks so inviting. 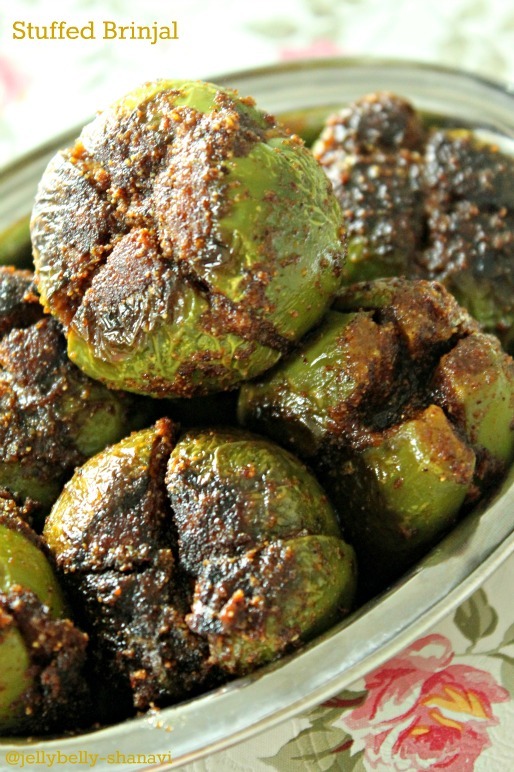 Omg, you are seriously killing me with your irresistible clicks, stunning stuffed brinjal. Beautifully stuffed brinjal.love the pics a lot. Looks delicious.. I have never tasted green brinjals..